This post is by Kiley Yerka. Earlier this year, I helped in my son's kindergarten class for a party. The kids were energetic, and needing them to calm down, I started to say, ‘It’s time to be reverent.’ Luckily, in that secular setting, I stopped before I got to the end and phrased it another way, but I had a hard time thinking of a proper substitute for the word. So many know that reverence means to sit quietly with arms folded. In that song, it uses several words to describe reverence: thinking, feeling, love, and heart. These words remind us that although reverence is shown in our (quote) ‘words and deeds,’ it must begin within. I love how Robert C. Oaks phrased that thought, in saying, "Reverence reflects activity of the heart, not just inactivity of the mouth." That reverent activity of the heart must be centered on our God. We give Him reverence. We revere Him–we honor, deeply respect, and love our Heavenly Father. This is reverence. This psalm begins with an exhortation to be still. This stillness, to me, is a complete stillness—of our hands and feet, and even our minds. The world is noisy, and is becoming ever more-so. I feel so over-stimulated–not only by children and the multitasking it takes to run a home and serve in both the church and the community, but by the constant stream of information in music, instant news, social media, and text messages. With all that is going on at once, it is extremely difficult both to take time to be still, and then, in those rare times of peace and quiet, to still my thoughts. But, keeping this scripture in mind has helped me as I choose to be still, and slowly train my brain to be still. ‘Be still and know that I am God.’ I like to think of that verse not as two separate thoughts, but as a cause-and-effect relationship. 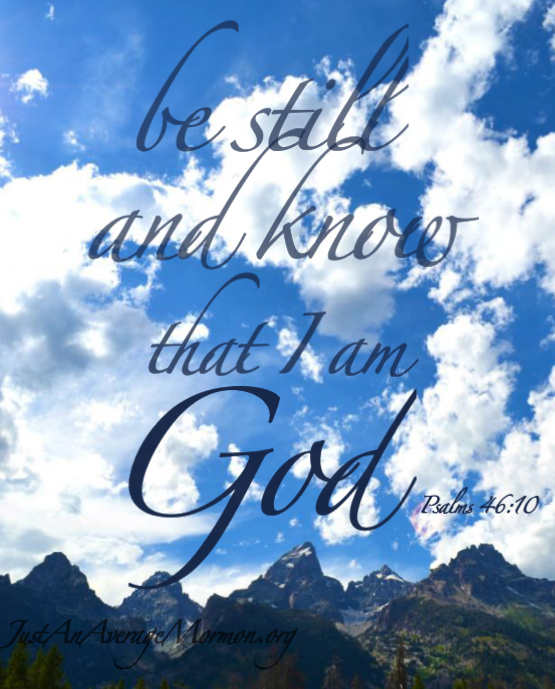 ‘Be still, and know that I am God.’ Be still in order to know that He is God. Through stillness, our minds and thoughts are open to revelation. And ‘line upon line, precept upon precept, here a little and there a little,’ (2 Nephi 28:30), we are given to know the mysteries of His kingdom, and to know Him as our Heavenly Father. A reverent attitude suggests that reverence can be part of our very being—almost a personality trait. It can be a way of living—a virtue that defines our actions every day, not just at church or at other meetings. We can, and should be a reverent people—full of that honor, respect, and love towards our God. I bear testimony that God is our Father—I have found that through moments of stillness and reverence in my life. And I know that I can continue to learn of Him as I develop an attitude of reverence. Read Kiley's other post here.